I’m not sure how to explain it, but I’m trying to look at the best of the best books that I read and see them as a librarian might–who needs this book? who would love it? I read this one recently and was very impressed. 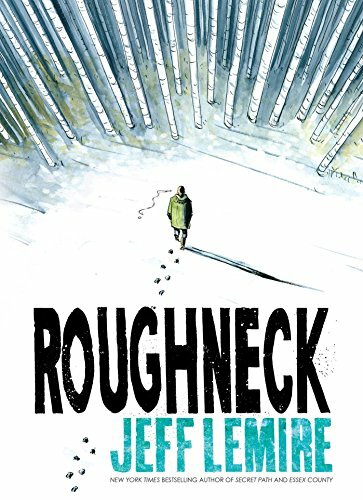 Roughneck is a standalone graphic novel by Jeff Lemire, who does a lot of work in comic books and may be best known for writing Old Man Logan, the inspiration for the movie Logan. What I know him best for is his series Sweet Tooth. This is a book that features a lot of violence, but focuses on the question, “What happens when you throw yourself away?” Two First Nations siblings in Canada who have gotten themselves into what at first seems like an insurmountable amount of trouble are given a narrow, narrow window to save themselves–but it doesn’t look like they’re going to be able to change enough to do so. I highly recommend this book if you need something to hand to a teen reader who is struggling with violence or short-term thinking, or who just doesn’t like to freaking read. It’s a quick but chunky read, about 270 pages more filled with action and the ice-cold Canadian setting than it is with dialogue or weighty description. I also have to admit that if you’re a grown-up who loves Bill Patterson’s art style and wondered what it would look like with adult material (there are no stuffed tigers), this would do up a treat, too. It takes writing time to write these posts. If you enjoyed this post, please take a moment to check out my latest book, One Dark Summer Night, or sign up for my newsletter.